Thoughts from a Traveling Tech: A walk down memory lane. Almost 10 years ago I joined with several friends and we formed a company called Ambush! Omaha. 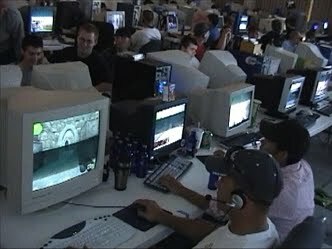 We ran LAN parties several times a year for groups as small as 25 people, and as large at 170 people. For the uninitiated, a LAN party is where a group aquires the use of a space for usually 1-2 days and sets up a network. Other people to bring their computers and connect to that network and play computer games against other attendees. Sometimes there are tournaments, usually there are random drawings for prizes provided by sponsors, and always there is food and caffeinated beverages. Our company also had servers setup in my residence for playing on the internet. We could login on our computers, start the game, connect to the servers, and play people around the world at anytime of the day or night. It was a grand old time, and we all loved what we were doing. But just like anything else, life has a way of bringing changes. Some of the people had jobs that took their time, and some had families that now took their time so they didn't play as often. Eventually the servers became unused and languished in a server cabinet in my basement. The company still exists, but I am the only remaining owner, and the website is now just a forum for the friends to communicate with each other periodically.